Kenner was so enthusiastic about resurrecting the ghost of Steve Austin (profit wise, that is), that the initial release of their new "Large Size" range consisted of eleven, yes eleven, of a family which would sadly only ever amount to twelve. The buying public matched Kenner's enthusiasm dollar for dollar, and the large figures were welcomed, at least at the outset. After all, these guys (and gal... sorry Leia!) were good. Packaged in stark, imposing window boxes featuring the familiar silver and black Star Wars logo plus a large photo likeness of the character within, they attracted eager young rebels like flies to a dead womp rat. And because of the detailing possible on larger toys, character likeness were nothing short of exquisite. Human facial detail (they really look like the actors), finely manufactured clothing (although, for some unknown reason, Obi-Wan has blue high-cut, painted-on briefs, whereas none of the others do), and way cool accessories (the Rebel Alliance Medal of Honor for Han; a dangling shoulder plait of beaded Wookie scalps for Boba Fett; sixteen individual removable ammunition cartridges for Chewie's crossbow... need I continue?). In short, they were the best thing since sliced Bantha steaks. So what went wrong? The future, as Kenner discovered, was a fickle old place. While public demand was high at first, interest in the "Large Size" range soon began to wane. After all, for the same price point as one of the big guys, a kid could buy seven or so small figures, one of their less expensive plastic vehicles, or maybe even a 3 inch figure playset. By hooking the buyers on their seemingly limitless small figure range, Kenner had unknowingly signed the guillotine order for their large figures. As a last gasp, the "Large Size Intergalactic Bounty Hunter" IG-88 was unleashed upon an apathetic audience in early 1980, with the highest retail price ever in the large figure line. Apart from the reappearance of Boba Fett in a box bearing "Empire Strikes Back" logos, IG-88 was alone, gathering dust on the toy store shelves like a turbo powered Hoovermatic. Lacking play value and outshone by their mini counterparts, buyer indifference had finally banished them to hyperspace. The "Large Size" Star Wars figure line was no more (addendum: I always found it amusing that the two bounty hunters were the last ones left... it's like they finally got lucky, wiped everyone out, picked up their cash from Vader... and then they aced him too!). All of those negative sentiments are now forgotten. 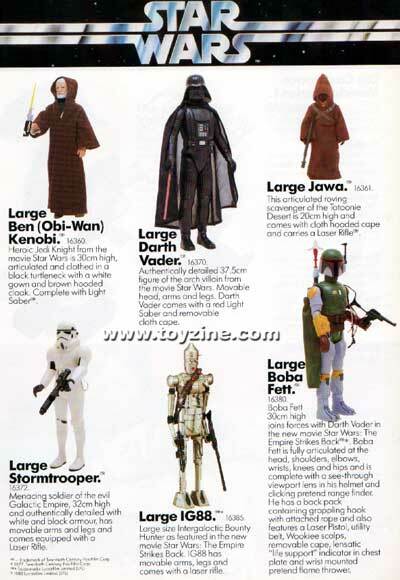 The Death Star has spun full circle... due to their great detail, their excellent character definition and their relatively limited production, the original "Large Size" figures are now in "Large Demand". With their original boxes and complete with their original accessories, they are your basic Star Wars collector's dream. Unboxed large figures, although less desirable are still popular with collectors if they are complete. This can be a big ask, especially when you consider some of the more heavily laden cast members (go on, have a look at Boba Fett's description on the Toltoy's Catalogue illustration... see what I mean?). OUR NEXT GREAT INSTALLMENT! WITH INTERNATIONAL PRICE GUIDE, PROTOTYPE PHOTOS AND MORE! IS HERE.